Is there such a thing as post-apocalyptic fantasy? Well, for LinCon 2011 the theme was post-apocalypse, and we made this special scenario for them, and now it is shared with all of you. 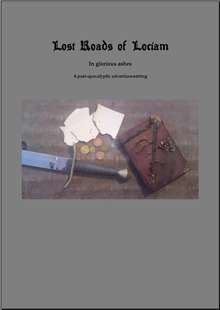 Lost Roads of Lociam is now celebrating its 20th anniversary, and this is the first of a few treats given out to celebrate the creation of this game! Enjoy.